This Fact Sheet provides Age and Service requirements for various Tier 4 retirement plans at a glance. Use this application if you are a Tier 4 member and wish to collect a retirement benefit due to disability. 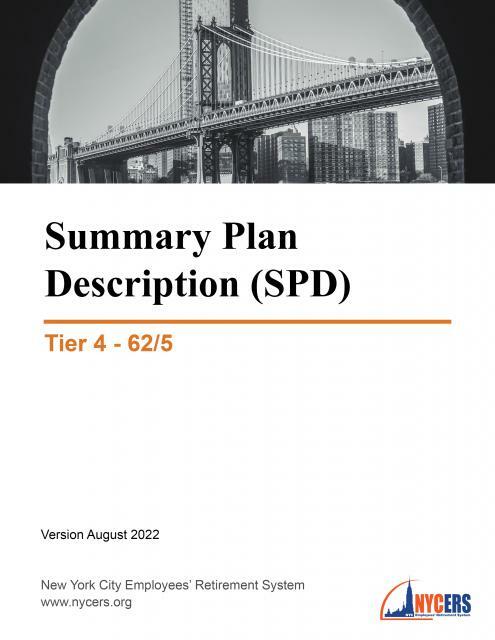 The New York City Employees’ Retirement System (NYCERS) is pleased to present the Tier 4 – 62/5 Summary Plan Description (SPD) booklet. The disability retirement process for Tier 3 and 4 members. 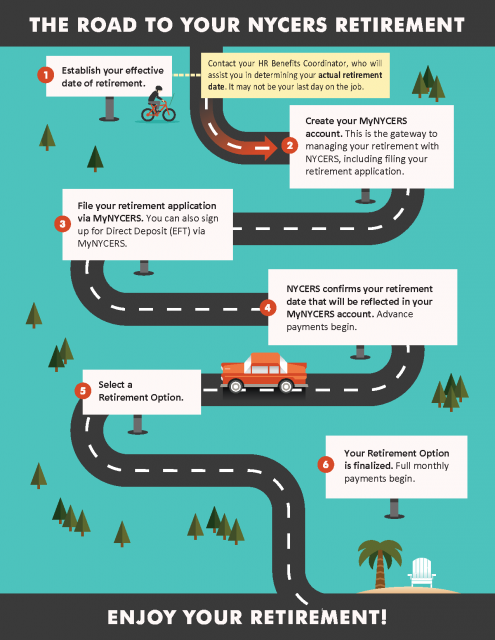 Learn how to Activate your MyNYCERS account for full access to all online services, including the ability to see an estimate of your retirement benefit, apply for and pay off a loan online, and change your address. The Omnibus Budget and Reconciliation Act of 1993 (OBRA ’93) reduced the maximum compensation limit under IRC 401(a)(17) for employees of the private sector. After a transition period the compensation limit was extended to include eligible participants of governmental state and local plans. For members, retirees, and beneficiaries who have changed their first or last name. You must attach proof of a legal name change, such as a copy of a Marriage Certificate or Judgment of Divorce. Submit this form if you wish to change the address that NYCERS has on file for you. Members and pensioners with a MyNYCERS account and a registered PIN can change their address online instead of submitting this paper form. For members and pensioners who wish to report a lost check. Note: You must wait 10 business days after the check mailing date before filing this form. How NYCERS determines a Tier 4 member’s Final Average Salary. Tier 3, Tier 4 and Tier 6 disability retirees are required each year to report any earnings from the public or private sector (Personal Service Income). This fact sheet provides answers to the most frequently asked questions regarding Personal Service Income. Download your Pension Payment Calendar here and never wonder when your next payment will be issued. If you receive your pension check in the mail, this fact sheet will explain the information that appears on the check. We encourage you to instead consider having your pension check directly deposited into the account of your choice through Electronic Fund Transfer (EFT). This brochure provides information for NYCERS service retirees who return to public service within New York City or New York State. This brochure describes the earnings limitations that service and disability retirees may be subject to if they decide to return to public service within New York City or New York State. For retirees who elected a pop-up option at the time of retirement and whose designated beneficiary has passed away. Complete this form to have your NYCERS pension check automatically deposited into your bank account by Electronic Fund Transfer (EFT). Direct Deposit is easy, convenient, and secure. No more waiting for the check to arrive; no more trips to the bank in bad weather! NYCERS periodically requests this form be filled out by retirees to help prevent fraud and ensure your identity is secured. Use this affidavit to report Workers’ Compensation payments you have received, and/or are currently receiving. File this form if you are a retiree who reenters public employment in the City or State of New York, and do not want to rejoin NYCERS. Pension payments will continue but your earnings may be limited. This form is for retirees who are reentering City service and want to rejoin NYCERS. You will not be held to Earning Limitations set by §212 of the RSSL, but your current pension payments will be stopped. This form is to be completed annually by all Tier 3, Tier 4 and Tier 6 Disability Retirees to verify your eligibility for continued disability benefits. Find out more about Personal Service Income. Submit this affidavit if you are unable to produce a birth certificate or any of the birthdate evidence documents accepted by NYCERS but can submit three alternative birth records. For a list of acceptable birthdate evidence, see NYCERS’ Birthdate Evidence Alternatives Fact Sheet #709. A list of alternative documentation that NYCERS will accept as evidence of birthdate if you cannot provide a legible, English-language birth certificate. Depending on the document(s) you provide, you may also be required to submit NYCERS’ Birth Evidence Affidavit #205. Tax consequences and rollover options when receiving a lump-sum payment from NYCERS. An explanation of what documents NYCERS will accept from members, retirees, or beneficiaries as proof of their name (not proof of date of birth) or change of name. This form is to be completed by the agency whose employee (or former employee) has filed a Notice of Participation with NYCERS indicating that he/she participated in WTC Rescue, Recovery or Clean-Up Operations during certain qualifying periods between September 11, 2001 and September 12, 2002. NYCERS encourages all active, vested or retired members (retired after 9/11/01) who participated in WTC Rescue, Recovery or Clean-up Operations between September 11, 2001 and September 12, 2002 to file a Notice of Participation Form #622 before September 11, 2018. If you previously filed for Disability Retirement and you now wish to withdraw that application, please complete this form in its entirety and return it to NYCERS. This application is to accompany your application for Disability Retirement. This form authorizes NYCERS to obtain medical information pertaining to those filing for disability. This brochure describes the retirement options for Tier 4 and Tier 6 Basic and Special Plan members. By selecting an option, you accept a reduced lifetime retirement allowance in exchange for the payment of a benefit to your designated beneficiary upon your death. If you do not select an option, you will be awarded the Maximum Retirement Allowance. Be sure you understand each option before you submit your retirement forms. This Retirement Option Election Form allows you to elect an option that provides a continuing benefit to your designated beneficiary after your death. By electing this option, you will receive a reduced retirement benefit. If you die within five (or ten) years from the date of retirement, the reduced monthly benefit will continue to be paid to the designated primary beneficiary for the unexpired balance of the five- (or ten-) year period. This form is for members in Tier 2, 3, 4 and 6 who have filed an application for Service or Disability Retirement or Payment of a Vested Retirement Benefit, or whose agency has filed a Disability Retirement Application on their behalf. This form allows you to elect one of two temporary options before you elect a permanent option and thereby make a final decision regarding the way in which your retirement benefit will be paid. NYCERS recommends that you choose a temporary option as soon as possible. This Retirement Option Election Form allows you to elect either the Maximum Retirement Allowance or an option that provides a continuing benefit to your designated beneficiary after your death. By electing a retirement option, you will receive a reduced retirement benefit. If you previously filed a Service Retirement Application with NYCERS, you may change your retirement date by filing this form with NYCERS up to the day before your effective retirement date. If your request is received on or after your retirement date, it is denied. Note: You cannot change your retirement date if you are already receiving your pension from NYCERS. You may withdraw your Service Retirement Application by filing this form with NYCERS up to the day before your effective date of retirement. If your request is received on or after your retirement date, it is denied. Application for members who wish to apply for Service Retirement. Complete this form to designate a Power of Attorney whose power will be limited to retirement benefit transactions involving NYCERS, and will not apply to any other matters. This affidavit should be submitted by anyone with a Power of Attorney that was signed over one year ago. Learn about the rights and options available to you after leaving City service. Many options are time-sensitive; we encourage you to read this brochure prior to leaving City service. Attention Non-Members: You may want to join NYCERS before leaving City service. By becoming a NYCERS member, you preserve your right to membership in the current tier. This may be beneficial if you return to public service in New York City or New York State in the future. Vesting is your right to receive a retirement benefit in the future if you have met the requirements of your plan even if you leave City service before you are eligible to retire. For members who have at least five but less than ten years of Credited Service and wish to terminate their membership by withdrawing their accumulated member contributions. Note: By filing this form and withdrawing your contributions, you will waive your right to a Vested Retirement Benefit. For Tier 4 members with Tier 3 rights who wish to receive payment for their Vested Retirement Benefit under the Early Service Retirement provisions. For Tier 3, Tier 4, Tier 6 and 22-Year Plan vested members who have reached retirement age and wish to receive payment of their Vested Retirement Benefit. For Tier 4 members with Tier 3 rights who wish to receive payment of their Vested Retirement Benefit. For Tier 3, Tier 4, Tier 6 and 22-Year Plan members who wish to vest their retirement benefit. Vesting refers to your right to receive plan benefits even if you terminate employment before you are eligible for payment of a Service Retirement Benefit. For members who wish to receive a refund of their accumulated salary deductions. Note that by withdrawing your accumulated salary deductions, your membership and all associated rights, benefits, and privileges will end. The consequences of a Non-Performing Loan and an explanation of how you can avoid these consequences in the event you are no longer on City payroll. An explanation of the taxability of your loan. ONLY for Tier 3, Tier 4 and Tier 6 Basic and Special Plan members who have submitted a Loan Application and the Voucher Date has not passed. For Tier 3, Tier 4 and Tier 6 Basic and Special Plan members who wish to change their loan repayment schedule. Application for eligible Tier 3, Tier 4 and Tier 6 Basic and Special Plan members who wish to apply for a NYCERS pension loan. Active members with a MyNYCERS account and a registered PIN who are eligible for a loan can apply online instead of submitting this paper application. Eligibility, benefits and application process to purchase service credit for time spent on active duty in the U.S. military. Military service must have been satisfactorily completed and a discharge under honorable circumstances must have been granted. A DD214 form is the most common proof of satisfactory military service. The benefits and the process for purchasing previous public service (buy-back). For employees of the School Construction Authority (SCA) who wish to purchase service for the time they were laid off for economic reasons on or after December 1, 2002 and prior to January 8, 2008. For NYC Parks Department employees in the titles of Climber and Pruner who wish to purchase service for the time they were laid off for economic reasons on or after July 1, 1991 and returned to active service no later than July 1, 1995. For NYC Carpenters and Supervisory Carpenters who wish to purchase service for the time they were laid off for economic reasons on or after June 1, 1991 and returned to service prior to July 1, 1993. For Department of Correction members who wish to purchase service for the time the member was laid off for economic reasons. This application is to be completed by the agency of the NYCERS Tier 1, Tier 2 or Tier 3 Corrections member who has applied to purchase previous child care leave. For Department of Sanitation Uniformed Force members who wish to purchase service for the time the member was laid off. In order to process a buy-back application, NYCERS must verify the salary and service history for the period of time the member wants to purchase. This form is to be completed by the agency the member worked for to provide verification of the member’s salary and service. It is not acceptable without the documentation listed on the form. Use this application to purchase (buy back) previous full-time or part-time public service rendered within New York State prior to your NYCERS membership. Note: Tier 1 members may only buy back public service rendered in a NYCERS-eligible title. For members who are currently paying for pre-member and/or military service through payroll deductions and want an estimate of their lump-sum payoff balance. For members who are currently paying for pre-member and/or military service through payroll deductions and wish to cancel their purchase. For members who applied to purchase pre-member and/or military service and wish to cancel their application before payroll deductions begin. For members who are purchasing pre-member service and wish to adjust the amount of payment. For Tier 4 and Tier 6 members employed in Police Communications titles who wish to opt out of the 25-Year Retirement Plan for 911 Communications Operators. In order to opt out of the 25-Year Plan for Police Communications titles, you must meet all the requirements outlined in the form. Note that this opt-out election is IRREVOCABLE. For Tier 4 and Tier 6 members employed in Special Officer titles who wish to opt out of the 25-Year Retirement Plan for Special Officers. In order to opt out of the 25-Year Plan for Special Officers, you must meet all the requirements outlined in the form. Note that this opt-out election is IRREVOCABLE. For Tier 4 and Tier 6 Dispatcher Members who wish to opt out of the 25-Year Retirement Plan for Dispatcher Members. In order to opt out of this plan, you must meet all of the requirements outlined on the form, complete this form and return it to NYCERS within 180 days of becoming a Dispatcher Member. Note that this opt-out election is IRREVOCABLE. Use this form to name a beneficiary to receive a one-time lump-sum benefit upon your death after retirement (Tier 2, Tier 4, and Tier 6 only). This affidavit is for the spouse of a deceased NYCERS member who is receiving an accidental death benefit and is required to attest to his/her marital status each year. This release must be signed by each individual with an equal or higher qualifying relationship than that of the claimant filing NYCERS Form #361, Affidavit of Benefit Claimed Under Section 1310 of the Surrogate’s Court Procedure Act, in relation to the deceased member. If your beneficiary is under the age of 18, you may use this form to designate a guardian to claim the benefit on behalf of the minor. This form may be used in conjunction with any of NYCERS’ Designation of Beneficiary Forms. The 62/5 Retirement Plan, also referred to as the Basic Tier 4 Plan, allows participants to retire with a full pension at age 62 with at least five years of Credited Service, or with a reduced pension between the ages of 55 and 61. Participants in the 57/5 Retirement Plan who have five or more years of Credited Service, at least two years of which are Membership Service, are eligible to receive a Service Retirement Benefit at age 57. Participants in the 55/25 Retirement Plan who have 25 or more years of Credited Service, at least two of which are Membership Service, are eligible to receive a Service Retirement Benefit at age 55. The 911 Communications Operators/25 Year Plan is available ONLY to members employed by the New York City Police Department as police communications technicians, supervising police communications technicians, or principal police communications technicians. Collectively these titles define a Police Communications Member. This brochure describes the benefits of the Triborough Bridge and Tunnel Authority (TBTA), also known as MTA Bridges and Tunnels 20-Year/Age 50 Retirement Plan (TBTA 20/50 Plan) which is available ONLY to those employed in a TBTA Eligible Position. This brochure describes the obligations and benefits of the Dispatcher 25-Year Retirement Plan (DIS-25). This plan allows participants to retire with 25 years of Allowable Service regardless of age and is available only to Dispatcher Members. A Dispatcher Member is a NYCERS member employed by the City of New York in the titles of Fire Alarm Dispatcher, Supervising Fire Alarm Dispatcher Levels 1 and 2, Director of Dispatch Operations, and Deputy Director of Dispatch Operations. This brochure describes the obligations and benefits of the Emergency Medical Technician 25-Year Plan (EMT-25 Plan). This plan allows participants to retire after rendering at least 25 years of Allowable Service, regardless of age. The EMT- 25 Plan is available ONLY to EMT Members. An EMT Member is a NYCERS member employed by the City of New York or the New York City Health and Hospitals Corporation in a title whose duties are those of an EMT, Advanced Emergency Medical Technician (AEMT), or a supervisor of those employees. This brochure describes the benefits of the Sanitation 20-Year Retirement Plan (SA-20) which is available ONLY to employees in the uniformed-force of the NYC Department of Sanitation. This brochure describes the benefits of the Special Peace Officer 25-Year Retirement Plan (SPO-25 Plan). The SPO-25 Plan is available ONLY to members employed in a series of Special Peace Officer (SPO) titles. This brochure describes the benefits of the Deputy Sheriff 25-Year Program which is available ONLY to members employed by the City of New York as Deputy Sheriff level one, Deputy City Sheriff level two, Supervising Deputy Sheriff or Administrative Sheriff. This brochure describes the benefits of the Automotive Member 25-Year and Age 50 Retirement Plan (AUT 25/50 Plan). The AUT 25/50 Plan is available ONLY to members employed in a series of titles performing automotive service work (Automotive Member Titles [AMTs]). This brochure outlines the benefits of the Transit 25- Year/Age 55 Retirement Plan (T25/55 Plan). The T25/55 Plan is available only to those employed in a Transit Operating Force (TOF) position. For Tier 2 and Tier 4 members employed in Police Communications titles who wish to elect the 25-Year Retirement Plan for 911 Communications Operators. Members in a Police Communications title are defined as: employed by the New York City Police Department as a Police Communications Technician, Supervising Police Communications Technician, or Principal Police Communications Technician. For Tier 2 and Tier 4 members employed in Automotive Service titles who wish to elect the 25-Year/Age 50 Retirement Plan for Tier 2 or Tier 4 Automotive Service titles. For Tier 2 and Tier 4 Sanitation members who wish to participate in the 20-Year Sanitation Retirement Program. In order to participate in this retirement plan, you must be in active service at the time of filing. For Tier 2 and Tier 4 Deputy Sheriff members who wish to elect the 25-Year Retirement Plan. A Deputy Sheriff member is defined as a member of NYCERS employed by the City of New York as: a deputy city sheriff level one, deputy city sheriff level two, supervising deputy sheriff, or administrative sheriff.